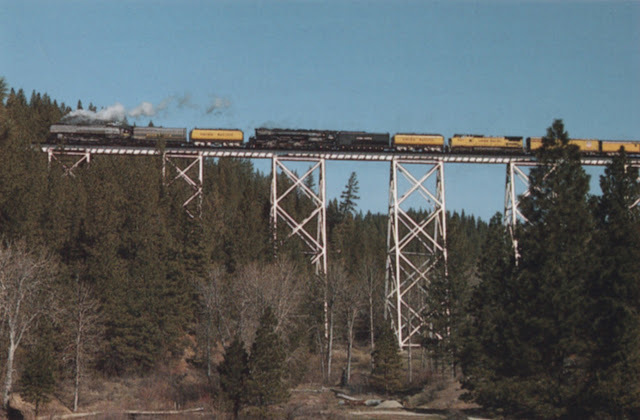 This week we're going to look at another railroad trestle bridge on the Union Pacific Feather River Line. When the Western Pacific began building their line through the Sierras they abandoned the narrow gauge tracks of the Sierra Valley Railroad, turning railroad towns into ghost towns and turning Portola into a major railroad terminus between Oakland and Salt Lake City. In order to maintain the 1% grade, the railroad built plate girder bridges on tall steel towers wherever they had to cross a canyon. The Clio Trestle is 200 ft above and 1000 ft across Willow Creek Canyon. This part of the line (built in 1909) carries the railway east to the railroad depot at Portola, then over Beckwourth Pass, and into Nevada. A trestle is defined as an open cross-braced framework used to support an elevated structure such as a bridge. It is undoubtedly an inexpensive way to carry a heavy train over a long, deep canyon but it's utilitarian appearance isn't very attractive. The philosophy that the most aesthetically pleasing structure for a site is the one that's most efficient at carrying its load is a nice idea that probably isn't true. In the photo below two steam locomotives pull classic rolling stock (photographed by Randy Woods in 1991) across the Clio Trestle on their way west to the 10th anniversary celebration of the Sacramento Railroad Museum. Plumas County, California Bridges: Clio Railroad Trestle across Willow Creek by Mark Yashinsky is licensed under a Creative Commons Attribution-NonCommercial-NoDerivatives 4.0 International License.